Hit the town in style wearing our Tyne Leather Jacket from BB Dakota. 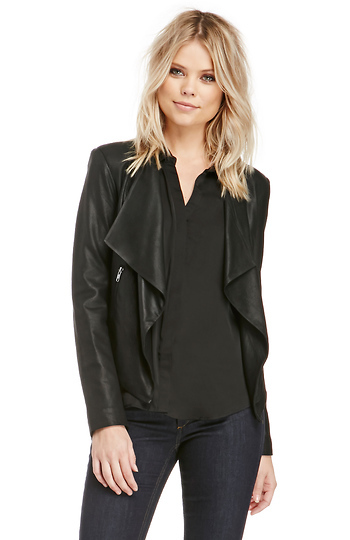 This lightweight jacket features sculpted shoulders, draped lapels, side zip pockets, long sleeves, full lining, and an open front that's perfect for a small bust. Add a touch of glamour with a statement necklace and cat eye. Love this. This goes with everything. I do have to get the arms shortened. I usually where an XS to S sizes. I am asian and have a 32D chest. ordered a XS and it fits perfectly. I tucked in the arms a little in the mean time before I go get them tailored. I have worn it out twice and have already received compliments. I purchased the taupe color and love it. So soft and a great fit. Can dress it up and down. Love this! Very cute but fit a little too small in the shoulders. I wear a Medium in everything and this was just too small. Yes! Love this piece - the taupe is great color and the jacket is a really versatile piece. It's winter now, but I'm sooo looking forward to rocking this for the other three seasons.